C & D Commercial Services knows the importance of first impressions, and helping your property to look its best. 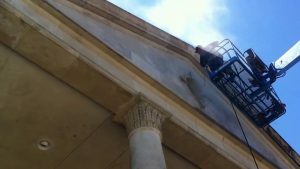 You can put your trust in C&D to be a dependable resource for the ongoing exterior maintenance needs of your property. C&D Services offers a full range of exterior maintenance services to the Dallas and Fort Worth area. C&D Commercial services provides its diverse list of exterior maintenance services to the Dallas-Fort Worth Area with a focus on parking lot maintenance. The team at C&D is well qualified to meet the needs of your business, whether exterior maintenance and repair or new construction. C&D Commercial Services operates 24 hours a day and 7 days a week, because we know that much of our work needs to be done at night so as to not interrupt the normal flow of the businesses during the day. The quality and attention to detail is what sets C&D Commercial Services apart from the competition. We are dedicated to meeting and exceeding your expectations through our outstanding service and quality workmanship. But you don’t have to just take our word for it, as our work has gotten attention. C&D currently maintains seven properties that have won Toby Awards, outstanding building of the year awards given by the Building Owners and Managers Association (BOMA). Please keep us in mind the next time you need exterior maintenance services. As one of the leading commercial property and maintenance and construction companies in North Texas, C&D can help you to set your property apart. Contact the helpful team at C&D for a Free Quote on your Exterior Maintenance Service needs.